Today I had a chat with a lady that works in the business as a manager within master data management. Our conversation came after some time into architecture, as I was curious. She looked a little annoyed and told me about the diagrams, metamodels, etc, that her company’s architects are creating and demanding the business to be involved in. She told me that they don’t understand why these models are created, what they are supposed to be used for. For them, it is like reading electrical design drawings. She also told me that the architects seem to see patterns and things in the models, but the business representatives don’t. Don’t you ask them what their architecture should be used for, I asked her. We don’t dare and actually don’t care, she said. 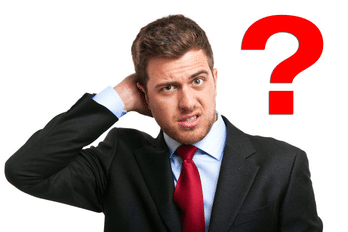 More than ten years after the introduction of Sogeti’s open concept DYA, Dynamic Enterprise Architecture, it struck me that the reasons behind DYA still is more actual than ever. Of course, it also disappoints me. Haven’t we come longer in 10 years? I think DYA, in its simplicity, is the smartest thing that has been created under the label Enterprise Architecture, ever! Actually, all organisations would benefit from adopting the DYA principles. First of all, if you are occupied in meta modeling of architecture, filling out architecture frameworks and trying to get the business to understand diagrams of different types, then you are not working with architecture, you are rather an engineering architecture itself. And what value does that create for the business? Not much I would say. 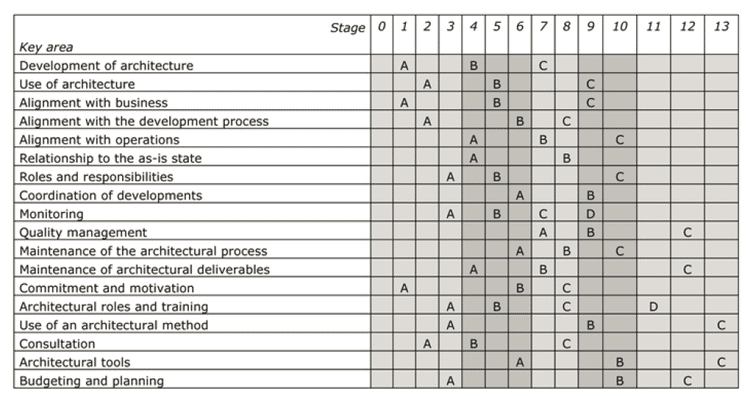 DYA has a maturity model that points out where to start, and how to proceed on a journey to excellence in architecture. Stage 1 is what to head for first. To my own experience, most architecture practices jump over that stage. This is clearly the reason why the business manager I mentioned, in the beginning, was confused and afraid about architects and architecture. Let us look at Stage 1 capabilities. Development of Architecture is about creating architecture that makes sense, that is understandable and useful. That is not about creating drawings that make the business afraid and confused. Alignment with Business is about creating and performing processes and procedures for a regular and continuous dialogue with the business. With this dialogue we learn what architecture makes sense, and we create and maintain a good relationship with the ones that we actually are doing architecture for. Commitment and Motivation is about making the architects committed and motivated to their task. No 1 is of course that the task is clarified. It is about focus and dedication. Without architects that are focused and dedicated to providing expected quality to their customers, mostly the business, there is no need for an architecture practise. The book ‘Building an Enterprise Architecture Practise’ (ISBN-10 1-4020-5605-2) is still very actual. The concepts behind the book and the maturity model is Dynamic Enterprise Architecture, DYA. 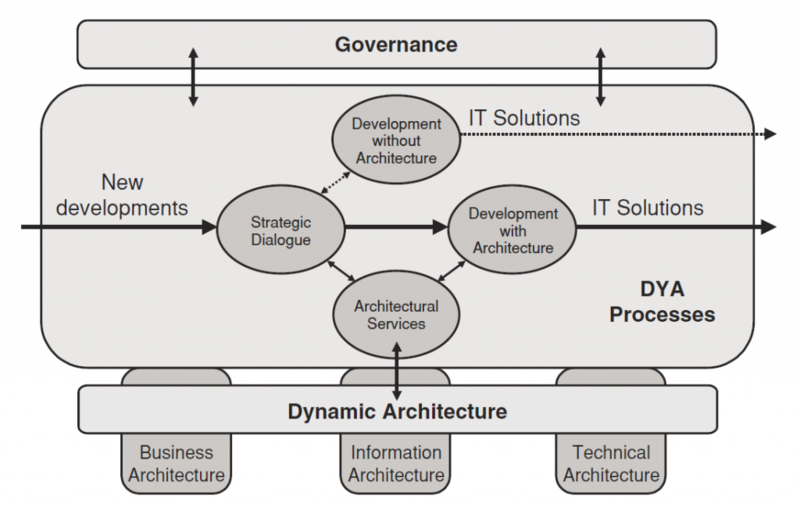 The DYA model is a process and governance-based model that implements an agile way of working with architecture. I will write a blog post later that describes in more detail how an agile architecture practise can be established. Until then, take a look at the principles of DYA as quoted from the book. Multidisciplinary cooperation. Architecture is a joint venture between the business and IT. Just enough, just in time. The trigger for developing architecture is a concrete business objective. The business objective determines both the focus and priority of architectural activities. The architectural team is kept small and, where necessary, expanded with employees from other departments. Project-start architecture. Development projects are guided and supported in their use of architecture by providing them with a project-start architecture. Standards and templates. Both the design of architecture and the development of IT solutions are accelerated by using standards and templates. Strategies. In addition to the standard way of complying with the architecture, a defensive and an offensive strategy have been developed, in which, by way of exception, a temporary IT solution is created that does not comply with the architectural guidelines. By introducing an explicit mechanism for deviation, the unavoidable incidental divergence from the architecture can be adequately managed and kept under control. DYA is a fantastic guiding concept and thinking for an agile architecture practise. It is more relevant today than ever..
By the way, the original DYA book is called “Dynamic Enterprise Architecture – How to make it work” (ISBN 0-471-68272-1).